Image © [caption id="" align="alignleft" width="240" caption="David Cameron speaking at the Big Society conference in March 2010. 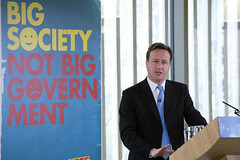 Image from the Conservative Party's photostream"] [/caption] The government’s ambition to create the Big Society has been undermined by new research by the TUC-backed pressure group False Economy, which claims that local authority spending cuts are harming the charity sector. According to the research, 2000 charities across England are facing budget cuts totalling £110 million, as a result of funding cutbacks by local councils. The government claims that these cuts are not a disaster for the voluntary sector, because charities will soon be able to obtain funding from the Big Society Bank, as well as from contracts to run public services. However, the local authority funding cuts which are already underway mean that some charities could be forced to close down before they are able to take advantage of these opportunities. This situation is very damaging to the idea of the Big Society, which is supposed to be about revitalizing both society and the public sector through charity volunteering. It could also be damaging to David Cameron’s legacy, because the Big Society is supposed to be his big idea (though eccentric policy adviser Steve Hilton, as well as ‘Red Tory’ philosopher Phillip Blond, also played a big role in shaping it). The Big Society represents an attempt to modernise Conservative ideology by dropping the Thatcherite emphasis on selfishness, while retaining Thatcherism’s belief in rolling back the state. In his victory speech after becoming Tory leader, Cameron updated Thatcher’s memorable phrase ‘there is no such thing as society’ by saying that ‘there is such a thing as society, it’s just not the same thing as the state’. Looking further back into Conservative history, the Big Society also contains echoes of Edmund Burke’s ‘Little Platoons’. This shows that it is not a completely meaningless concept, as many suspect. However, even if it does have a real meaning, it is becoming clear that the government is not taking its own idea seriously. The aspect of the policy which involves rolling back the state has already begun, but the increased charity involvement has failed to materialise. As a result of this, many people rightly suspect that it has become a fig leaf for public spending cuts. The Big Society will probably come to be seen in the same light as the big ideas promoted by Tony Blair before his election victory in 1997: the ‘Third Way’ and the ‘Stakeholder Society’, both of which seemed to evaporate once Blair got into power. Like these ideas, the Big Society will go down in history as an empty buzzword, whose purpose was to give an impression of fresh thinking, while meaning very little in reality and having a negligible effect on government policy. The Big Society – a big load of hot air? The government’s ambition to create the Big Society has been undermined by new research by the TUC-backed pressure group False Economy, which claims that local authority spending cuts are harming the charity sector. According to the research, 2000 charities across England are facing budget cuts totalling £110 million, as a result of funding cutbacks by local councils. The government claims that these cuts are not a disaster for the voluntary sector, because charities will soon be able to obtain funding from the Big Society Bank, as well as from contracts to run public services. However, the local authority funding cuts which are already underway mean that some charities could be forced to close down before they are able to take advantage of these opportunities. This situation is very damaging to the idea of the Big Society, which is supposed to be about revitalizing both society and the public sector through charity volunteering. It could also be damaging to David Cameron’s legacy, because the Big Society is supposed to be his big idea (though eccentric policy adviser Steve Hilton, as well as ‘Red Tory’ philosopher Phillip Blond, also played a big role in shaping it). The Big Society represents an attempt to modernise Conservative ideology by dropping the Thatcherite emphasis on selfishness, while retaining Thatcherism’s belief in rolling back the state. In his victory speech after becoming Tory leader, Cameron updated Thatcher’s memorable phrase ‘there is no such thing as society’ by saying that ‘there is such a thing as society, it’s just not the same thing as the state’. Looking further back into Conservative history, the Big Society also contains echoes of Edmund Burke’s ‘Little Platoons’. This shows that it is not a completely meaningless concept, as many suspect. However, even if it does have a real meaning, it is becoming clear that the government is not taking its own idea seriously. The aspect of the policy which involves rolling back the state has already begun, but the increased charity involvement has failed to materialise. As a result of this, many people rightly suspect that it has become a fig leaf for public spending cuts. The Big Society will probably come to be seen in the same light as the big ideas promoted by Tony Blair before his election victory in 1997: the ‘Third Way’ and the ‘Stakeholder Society’, both of which seemed to evaporate once Blair got into power. Like these ideas, the Big Society will go down in history as an empty buzzword, whose purpose was to give an impression of fresh thinking, while meaning very little in reality and having a negligible effect on government policy.